If you don't want to use the main web chat to connect, you can try these methods. Use the link below to sign up for a free account. Fill in your nickname where asked. If your nickname is registered on the server, use the 'advanced' tab to enter in your nickname password. The cloud service will automatically log into your name for you. Once you have created an IRCCLoud account, you can also easily use the mobile apps to connect and chat from your mobile phone. 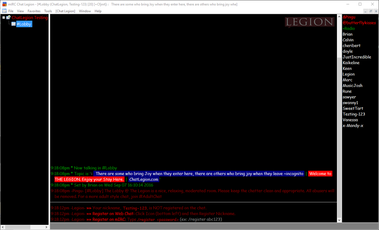 The Legion mIRC script is setup to auto connect to Chat Legion. When you first load it, it will ask you for your chat nickname and password. After that, it will auto connect you into chat. 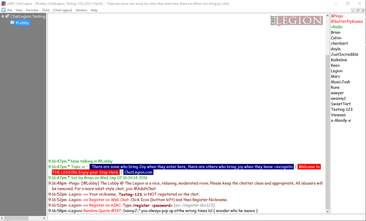 You can use the [ChatLegion] menu for additional options.